Peter Hughes studied violin at the New England Conservatory, Bowdoin College, and the Longy School of Music. Performing experiences include the Massachusetts Symphony since 2001, chamber music in the MetroWest area, as well as freelancing in orchestras, solo settings, and community theatre since 1990. Peter is trained to teach classical methods and uses Suzuki books together European scale and etude books. He has taught at established, well-known schools in the Central MA area including Joy of Music and the former Robinson's Music, now M&A. 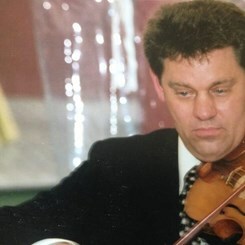 Peter explains in his teaching philosophy, "In many ways I am like a mechanic who can quickly diagnose technical issues, and offer clear guidance on bowing and left hand issues. Then, I guide the student to become aware of his/her unique sound and individual musical "voice" which is even more important, and makes technique a means to that end."